Sometimes we are working with our machines without touching the mouse or pressing any key, because we are reading some eBook, any article or watching the show or movie or like anything. And as system has to go to sleep according to the power plan which cause hindrance in our activity and pull out our attention. So this needs to be solved. We want to wake up our system in such instances. We can do this by setting our power plan so that it won’t let our machine sleep even though we don’t press any key or touch mouse. You can do this by built in way from Windows or adding any Third Party Tool. Just navigate down through the article to find suitable way for waking up your machine. 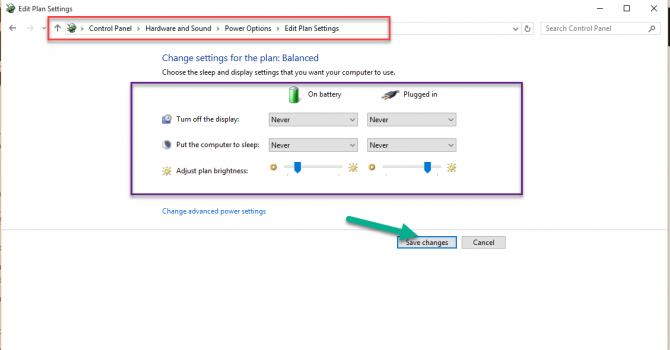 You can solve the issue of sleeping of your system through playing with your settings. It’ll be solve in a minute or less. Go to “Control Panel\Hardware and Sound\Power Options\Edit Plan Settings”. And then select the option of “never” from the list for both “On Battery” and “Plugged in”. And click on “Save Changes”. So you are done with making your system wake up. You just change the setting for only one plan, if you have more than one plans then you need to change the settings for each plan. Go to “Control Panel\Appearance and Personalization\Personalization\Change Screen Saver” and then a new window will open “Screen saver Settings”. Un-check the box of “On Resume, Display Logon Screen”. This will not let your system sleep. Here come s little frustrating issue by using built in ways for waking up the system. The settings you store or change goes for permanent. 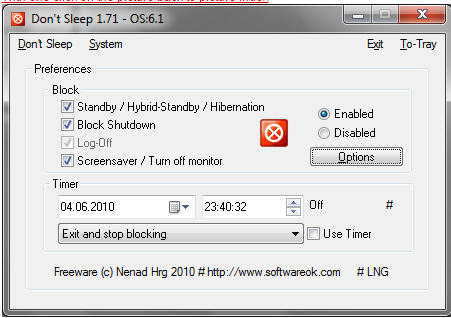 And if you want your system to go for sleep in specific time, it won’t happen due to these settings. To avoid this, you can use Third Party tools which are listed below. The advantage of using this tool is that it can provide you a Timer, which helps you to making your settings changeable. If you want to wake up your system for specific hours, just add that time limit in timer and switch on the timer. Don’t Sleep saves your time by not touching again and again to your system so that it may not go to sleep. And it is very easy in use. Insomnia is present for both 32 Bit and 64 Bit Windows. It is very small and simple utility. 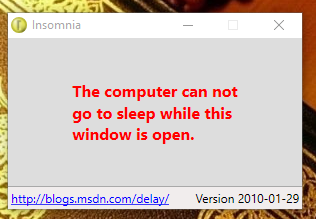 On installing, a small window will appear to your screen that says that “the computer can’t go to sleep while this window is open”. So as long as we opened the window, our machine will stay awake and will not go to sleep. So we don’t have to set any timer or anything else regarding settings for making our system awake. This is very simple and easy tool for use. Just let the window open and enjoy the sleep-less system as long as you want. The Noise tool is available in your system tray. You can easily pen it by clicking its icon and enter any key. You can also add combinations of Number key and Character key. These all are simple and easy ways to stop your system from going to sleep or making your system’s screen off while watching any movie, reading any eBook or downloading any file. These all tools will provide you simple installation and easiness in use.